British energy companies have recently put prices up yet again and many tenants are concerned about how they can heat their homes and cover the rent and other bills. In an ideal world all homes would be double or triple glazed but that might not be an expense that landlords want to go to in older properties. However there are things that you can do to save money on heating costs and none of them cost a fortune to implement. Here are are our top tips for tenants to keep warm this winter. If you don’t have double glazing it is likely that you will be losing around 20 percent of the heat through them. A temporary winter fix for this problem is purpose made transparent film that you can attach to the window frames with double sided sticky tape and then smooth it out by using a hair dryer. It won’t allow you to open the windows but it will stop you losing so much heat through them. For a medium size property you will pay about £15 – £20 for this polymer membrane including the adhesive depending on the size of your windows. For those windows that you don’t open, the film can last for 2-3 years. Self adhesive foam is another option you can use to prevent heat escaping to seal any gaps between the window and frame. During the day, draw back curtains or blinds to let the sunshine in (when there is any) but make sure you close them again as night draws in. Heavy curtains are great for preventing heat loss. If you don’t have two full sets of curtains (one for summer and the other for winter) you can either line your existing light curtains with a thermal or fleece lining or have a hunt around charity shops, hotel equipment or general household goods auctions to get some spare curtains, if you can’t afford new ones. Hotel curtains are invariably lined and heavy and can be picked up relatively cheaply at auctions. You may have to fork out for dry cleaning but these curtains can last a lifetime with care. Heavy curtains can also keep the home cool in the summer. In recent years the bare floorboard look has come back into fashion which is great if your floors are insulated but not so good if they are not. Particularly heat can be lost through the gaps and cracks in them. These should be filled with a suitable silicone based filler that is tolerant to movement. Wooden skirting and floor boards expand and contract with changing temperatures and daily use. According to the NEF (National Energy Foundation) you can lose up to 10 percent of heat through the floor. 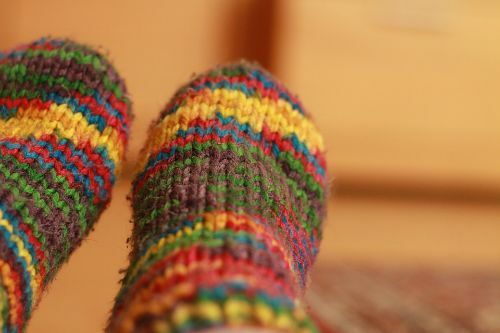 Putting rugs down in the winter will be warmer for your feet and also mitigate heat loss. Radiators that are attached to the inside of external walls are less efficient because there is a certain amount of heat loss through the wall. You can prevent heat loss on all radiators by attaching either purpose made reflective aluminium foil to the back of your radiators or ordinary good quality kitchen foil. With the foil in place the heat is reflected back into the room and prevents heat loss through walls. Purpose made foil costs around £10 and is more effective than kitchen foil. If you have a decorative fireplace that isn’t used very often you can invest in a chimney balloon which will cost around £20. This will stop a lot of heat disappearing up the chimney and prevent cool air getting in. The balloon is place just inside the chimney so that it can’t be seen and then inflated. However, remember to take it out if you decide to light a fire. You might not notice in the summer but letterboxes and keyholes can cause draughts. For the winter you can attach brushes or rubber barriers to prevent mini draughts. If you leave them on all year round you might reduce your junk mail significantly because it is not so easy to post multiple offers through a narrower slot. You can also purchase keyhole covers very cheaply to prevent cold air coming through them. These are just a few ways you can keep warm and save money on heating but if you have any useful tip for tenants to keep warm this winter please do share them with us.